Clean Air for healthy sleep & a healthy baby. Baby's Breath is the National Sleep Foundation Bedroom Machine by Austin Air. It provides the best overall protection and particulate filter ever created by Austin Air. It is specifically designed to give you and your family better quality sleep & healthy air in the home. Independant studies and numerous awards have verified that this is the best air purifier you can find. 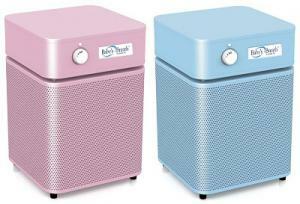 Certified by the National Sleep Foundation and recommended by Doctors throughout the world, the Baby's Breath Bedroom Machine cleans up to 750 square feet to create a healthy breathing environment. Proudly made in the USA by Austin Air - the leading manufacturer of air purifiers. Their units were chosen by the U.S Government to help address the crucial air quality issues in New York during the aftermath of 9/11. They fulfilled an order for air cleaners that was the single largest deployment of air purification units ever in U.S. history, and were chosen under the careful guidelines of FEMA and the Red Cross. That's why Earthsake chose them to be our exclusive vendor for Home Air Purification systems. Designed from the inside out, with their engineers focusing first on the most important element of the air cleaner, the filter - the most sophisticated yet. This unit has a unique air intake system that is able to pull air in from all sides, or a full 360 degrees. This particular design allows for maximum intake efficiency and allows for more purified air to be delivered faster into the home environment. Every minute that this air cleaner is operating, 250 cubic feet of air is able to be processed through a four-stage filtering system that step-by-step progressively removes the contaminants from the air. The manufacturers claim that this high level of processing the air enables their air cleaners to: reach the highest possible levels of performance; achieve superior air flow levels; offer a longer filter life (estimated at 5-years with basic residential use); and extend the life expectancy of the Medical Grade HEPA used (the most important aspect of the filtration process). In order for any home air cleaner to be truly effective in a given space, it must be capable of removing sub-micron particles, chemicals and noxious gases. It must also be able to achieve this without creating unwanted byproducts, such as ozone. This is an Earthsake requirement! These superior units exceed those requirements and, regardless of the size of the unit, include true Medical Grade HEPA filtration material, and activated carbon, which is known to be the only trusted air filtration system technology widely used in operating rooms and throughout hospital settings. Who should consider The Baby's Breath Bedroom Machine by Austin Air? Why is The Baby's Breath Bedroom Machine by Austin Air the best choice? •Keeps your bedroom fresh and clean. 16.5"(h)x11"(w)x11"(h) cleans up to 750 square feet. Also comes in a LARGER size known as The Bedroom Machine(available in 5 different colors) which cleans up to 1500 square feet. Chosen by Earthsake and the National Sleep Foundation to provide healthier sleep & cleaner indoor air. Five years on all parts and labor excluding the filter cartridge. The filter cartridge comes with a 5 year pro-rated guarantee.